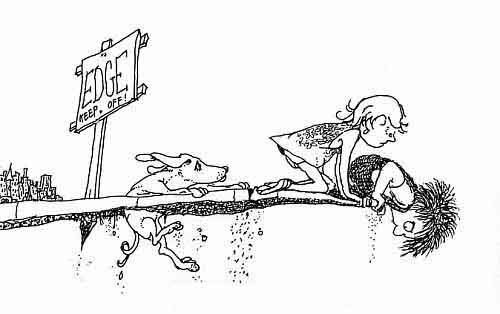 If you’ve ever read the collection of poems by Shel Silverstein, Where the Sidewalk Ends, then the phrase Complete Streets might remind you of the image above from the cover of his book. Complete Streets [broken link removed 10-4-2016] are streets;designed and operated to enable safe access for all users, including pedestrians, bicyclists, motorists and transit riders of all ages and abilities. So when a road is ‘incomplete’ it doesn’t mean the road ends abruptly at the edge of a cliff, it means that some of the road users were taken out of the equation. And for those people not considered, it may very well feel like they’re dangling from the edge of a cliff when they’re trying to cross the street with traffic zooming by at 45mph with no pedestrian crossing. This is exactly why the National Complete Streets Coalition was born and why they urge cities, counties and states to adopt and implement Complete Streets policies. Making the streets safe and accessible to everyone has many more benefits to a community than the obvious. For example, study [broken link removed 10-4-2016] after study [broken link removed 2-21-2018] after study [broken link removed 2-19-2014] has shown that complete streets boost the local economy. With the good outweighing the bad, it makes sense to get everyone on board. I recently attended a Complete Streets Implementation Workshop that aimed to give guidance to those who are looking to get on board and adopt a Complete Streets policy. The workshop featured a panel of local and state officials from the Washington D.C. region where they discussed their experiences with implementing the policy. What kind of internal opposition was experienced when adopting the policy? How was the opposition handled? How are concerns from the public addressed? Is the public involved in the decision making process for Complete Streets projects? What were the biggest obstacles to adopting the policy? What are the difficulties that are experienced in implementing the policy? Zanna is the Events and Outreach Coordinator for BikeArlington. She loves Shel Silverstein’s poems ALMOST as much as she loves complete streets. She hopes some day all of Arlington’s streets will be complete.